I’ve had eggnog that is hardly richer than milk. I’ve had eggnog that doesn’t have any milk at all, just a mixture of cream and whipped cream! I’ve had eggnog that is mostly booze. Or without booze. Some people feel whisky is the only apropriate spirit. Others rum. And so on. 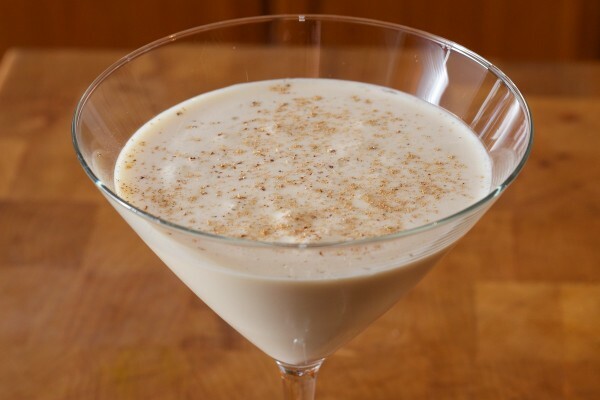 Craft cocktails are super popular right now, and I wanted an eggnog recipe that was in the same vein. Hey. Nobody said I’m above a trend. This recipe is cool for a couple of reasons. Gross. Gross. Gross. And gross. Don’t do this. First, it is aged. The eggs, sugar, and booze are mixed, then aged for a month (up to a year!). This supposedly produces a mellower, rounder, fuller flavor. The alcohol also kills any bacteria that my be hanging around in the uncooked eggs. Second, it is shaken, on ice, portion by portion, in a cocktail shaker. This is partly for show, but the big benefit is that each serving is bracingly cold, and still frothy from being shaken. Don’t listen to purists. They will tell you that whisky is the one-true eggnog spirit. Others say rum. Others cognac. Some madmen advocate sherry. Ludicrous! To ensure it that all my bases are covered, I’m using a combination of bourbon whisky, rum, and brandy. So, how is it? Definitely more toward the “cocktail” end of the spectrum, with a lot of alcohol, but still a real-deal eggnog. It is damn fine, and I’ll make it again. I’ve already made a batch which for next year, and I intend to have a taste test of 1 year vs 1 month vs fresh. I’ll update this post with results in a year! I tried 1 year vs 1month vs fresh. All are good, but different! Fresh: Foamy, relatively thin texture, brighter flavors, more “milky”, more obvious dairy flavors, light in color. 1 month: No foam, thicker/smoother texture, lots of rick smooth mouth feel, round, full, mellow flavors, some caramel notes. Very different from fresh. 1 year: Like the 1 month version, but a bit more so. So thick it’s hard to believe it doesn’t have a thickener such a carrageenan or something in it. All in all, I’d say that the 1 month and 1 year version are pretty similar. If you like the mellow, round flavors, and the texture, you get about 85% of the way there in just a month. If you want even more of that, by all means, go for the year. There is a certain romance and showiness too that comes from serving someone the longer aged version. But don’t discount the fresh, depending on your preferences you might like it better. Certainly is is more like a “traditional” eggnog. Except boozier. Yum. Beat eggs, sugar and salt together, until sugar is dissolved. Slowly add (slow matters, too fast will curdle the egg!) booze, while mixing constantly. Bottle in a clean jar or glass, then store in cool, dark place for a month. Shake vigorously, pour into a glass, top with ground nutmeg, and serve! This was written by cedar. Posted on Tuesday, December 25, 2012, at 10:12 pm. Filed under Recipes. Tagged cocktail, dessert, science!, weird, winter. Bookmark the permalink. Follow comments here with the RSS feed. Post a comment or leave a trackback. I’m testing out facebook comments. Would you prefer native comments (like this) or facebook comments? I need to choose one, both is too awkward. 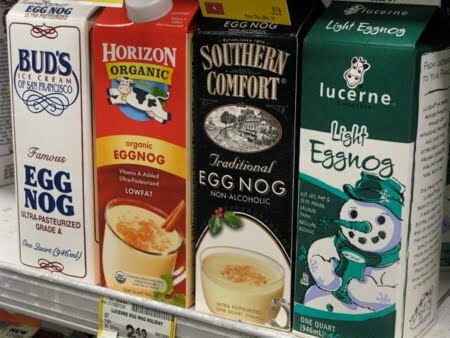 Awesome; I was thinking about making egg nog this year. Well, I’ll be ready for 2013! But you forgot the most important part; how was it? Was it AMAZING? It was damn fine. More of a cocktail than many eggnogs, but that is OK with me! I’m not positive how much the aging helps, but I’ll find that next year when I do my 1 year vs 1 month vs fresh taste test. Mmmmm. Sound lovely. Will try the recipe. Would prefer comments here since I don’t use FB. It’s now Sept.22, 2013, and I’ve just found this. Three months and three days… I can’t wait to see what happens!